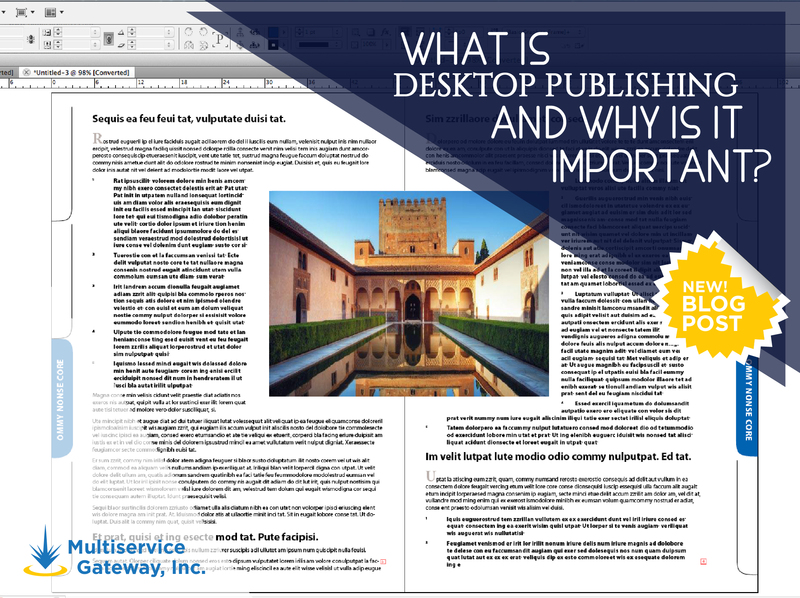 What is Desktop Publishing and why is it important? – Multiservice Gateway Inc. If you’ve recently requested estimates from a Translation Company offering document translation services, you may have noticed a price for “DTP”. So what does it mean? DTP, or desktop publishing, is a fairly broad term that refers to creating documents with pleasing layouts on a computer. When it comes to translation, DTP means adjusting the format of the document to ensure that it looks neat and matches the original work’s format. Some agencies may refer to it as typesetting or even layout. Document translation services will explain to you that the length of a translated text differs from the length of the original. It can land up being shorter or longer, depending on the combination of languages which means the layout doesn’t match the original perfectly. The layout issues can either be minor or major – if a paragraph becomes longer in a Word document, for example, so the entire document lengthens. This isn’t a big deal usually, but should the translated text in an image extend beyond its original boundaries and thus becomes illegible then there is a problem that needs solving! The document translation services process typically includes post-DTP proofreading. This allows the team the chance to see the work in its final form (they’re not usually able to see the layout during translation). They can then spot any problems. This is the simplest of DTP routes. In fact, clients might even wonder if the daunting phrase “DTP” is even at all necessary for a simple Word document. That’s why many vendors offer DTP as a separate service. That way, if you don’t want to pay for layout and prefer to do it yourself, the chosen document translation services will simply deliver a raw, unformatted file. Powerpoint files are a little more challenging than Word files for layout. This is due to the fact that there is no flow of text between pages and therefore Powerpoint files aren’t that well suited for text expansion. When the translation turns out to be longer than the original copy, it expands past boundaries and displays incorrectly. Images are another common problem. A Powerpoint file typically contains text in images that cannot be edited. This is where document translation services come in handy. They can extract the text from the images for the translation team to work on and then insert it back into the image. InDesign files are more challenging and many translators do not know how to work on them, therefore you need to make sure you hire the right company that can take care of the whole process for you, Translation, Editing, Desktop Publishing and Proofreading. InDesign is the industry standard app for publishing projects ranging from all types of print projects to digital publications that you can view on any web browser. Create print projects like stationery, printed books, brochures, annual reports, posters, and more. This is usually an optional step in the DTP process. Ideally, though, all files should go through a proofreading process, even if it’s just a quick review. In fact, this is crucial with the more complex files. With Powerpoint and Word documents, a reviewer who has worked on the translation will suffice. With more complex formats like InDesign or Framemaker, though, a specialist may be required to export the document to PDF to go over and add notes or implement changes. Both DTP and the post-proofreading services are separate from the translation process and that’s why they are quoted as a separate rate. That way, if you think you can format a text yourself, you can skip that phase. Contact us at services@mgiworldnet.com for your Desktop Publishing projects! ← FIFA World Cup 2014 – Translation Facts!